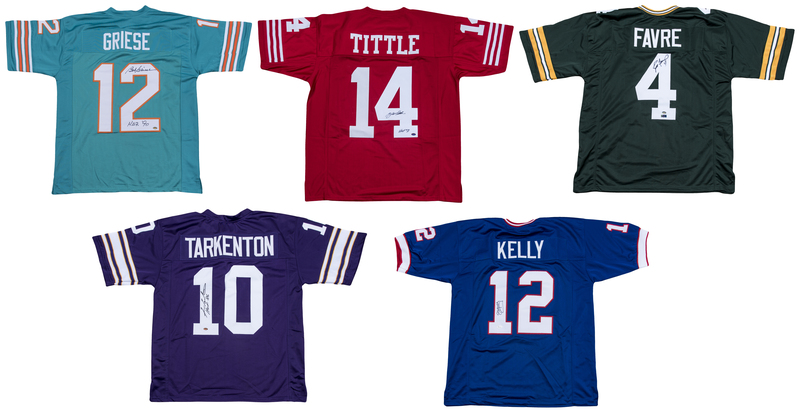 Presented here is a collection of five jerseys signed by Hall of Fame quarterbacks. 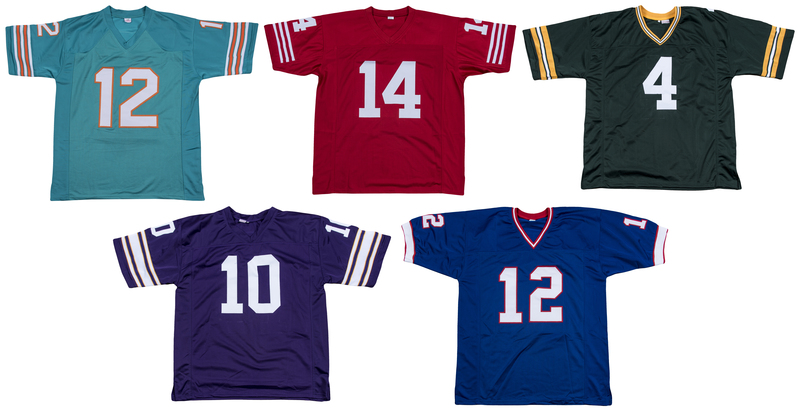 The first jersey in this lot is a purple Minnesota Vikings home jersey signed by Fran Tarkenton in black marker. The second jersey, a red New York Giants top, has been signed in black marker by Y.A. Tittle. 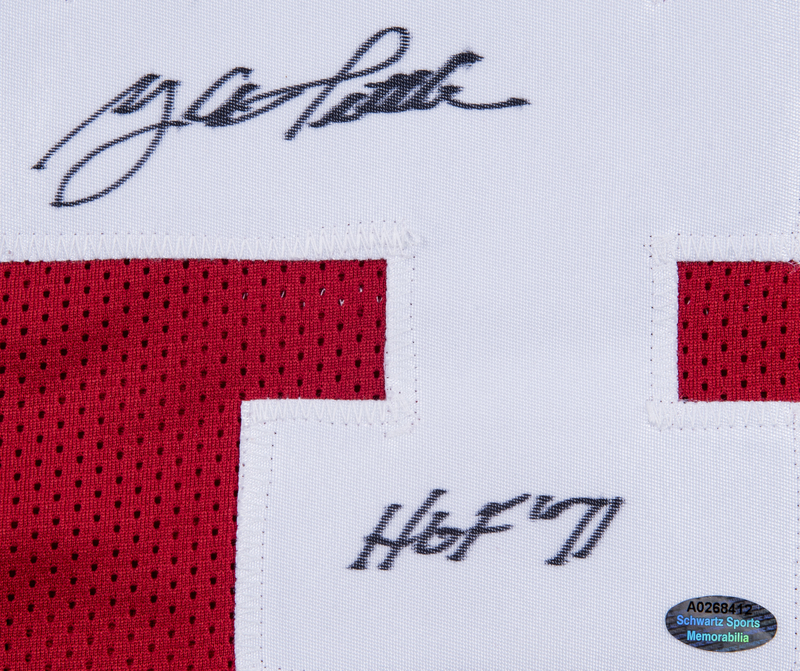 Tittle added the inscription “HOF ‘71” below his signature. 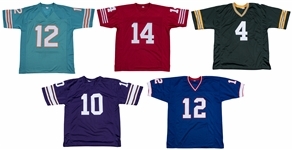 The third jersey is a teal Miami Dolphins jersey signed in black marker by Bob Griese. Griese inscribed “H.O.F. 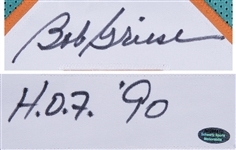 ‘90” below his signature. The fourth jersey in this collection is a Green Bay Packers home jersey signed in black marker by Brett Favre. The fifth and final jersey is a blue Buffalo Bills home jersey signed in black marker by Jim Kelly. 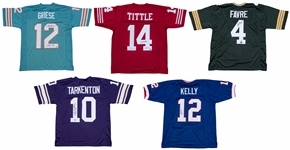 The Tarkenton, Tittle, Griese, and Favre jerseys each come with a Schwartz Sports Memorabilia hologram (Tarkenton: A0268409, Griese: A0268410, Favre: A0268411, Tittle: A0268412) while the Kelly jersey is accompanied by a COA from JSA (WP963497).